Lower back pain is not only a debilitating condition, but a very common one, and can be caused by a host of different things; whether you push yourself a little too hard while weightlifting, like most us, spend a lot of time working front of the computer, chances are you will suffer from some kind of back pain eventually. And when you do, what were once seemingly simple and everyday activities such as sitting, driving, lifting, bending over – all notoriously bad for your back – will become horrendously painful and maybe even impossible. When that happens, you may find a back brace to be of great relief. When suffering from back injuries, it’s important to stay as active as possible; inactivity and underuse of your muscles only leads to them becoming weaker and stiffer over time, exacerbating the pain and prolonging it. A comfortable, properly fitted back brace limits the movement of the spine, and keeps you from aggravating any existing injuries. By supporting your back and keeping it in the proper position and posture, it will also relieve the pressure on your nerves and muscles that cause the pain in the first place. What Kind of Back Brace Do You Need? There are a few different kinds of back braces out there, and each has its own function. The most common kind is a lower back brace, which supports your lumbar spine. These are best for supporting and relieving pain from disc problems, sciatica, etc. They can also be hard or soft; soft braces are made from elastic material, and serve to prevent forward spine motion, provide some extra support, and serve as a reminder of the proper posture and position for your spine. They may or may not come with an insertable pad or stay, that allows you to choose how much comfort and support you want for your lumbar spine. Hard braces, on the other hand, are usually made from rigid plastic, and function by keeping the spine and lower back as stiff as possible and restricting movement. These are best for recovery from injuries, where you must limit bending and drastic movements to avoid aggravating or worsening the condition. When lifting an object, the brace forces you to use proper lifting technique, lifting with your legs as opposed to your back. The second type of back brace you will see are upper back and shoulder braces. These are meant to provide support for your upper back and the thoracic region, and improve posture through support and muscle memory. Improper or poor posture often leads to both lower and upper back pain, and by correcting it, shoulder braces both relieve back pain and help actually solve or avoid the problem in the first place. These can be especially useful for those of us who sit slumped over a desk all day. Some back braces, such as the Comfort Posture Corrector from TOROS Group, provide support for both the upper and lumbar back. As always, which one is right for you will depend on the exact problem that ails you, as well as what your doctor recommends. 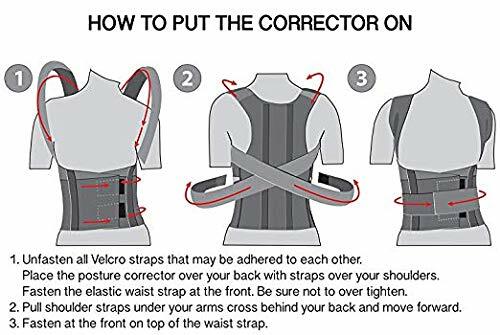 The most important things you should keep in mind, however, are that your back brace fits your waist properly, is comfortable, and easy to adjust. A common criticism of back braces is that, when worn too often, they cause your back muscles to weaken and lose their ability to support your back; supposedly, if your back muscles aren’t doing the working, they will eventually atrophy. But this is not necessarily true. While this could possibly happen if you wear the back brace while sleeping or sitting around, wearing a back brace a few hours a day, especially while being active, driving or lifting, will not cause problems for your back. And of course, if you simply wear it all the time and rely on it for all activities at all times, you could run into some issues. The BraceUp is a top seller for back braces, and for good reason. It’s a fully adjustable back brace that allows a full range of motion, with eight extra stays that add additional lumbar support. Dual adjustment straps allow you to customize the fit as you like, while the breathable mesh panels allow you to breathe and stay cool while wearing the brace. 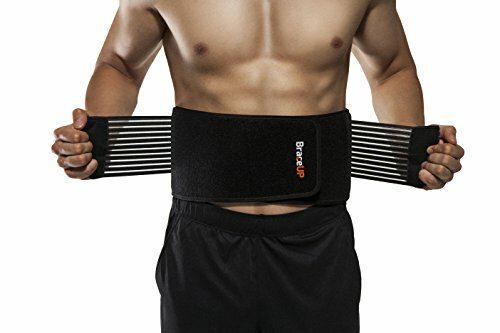 It provides just the right amount of compression to keep your back supported, without being restricting or suffocating on your waist. The BraceUp is appropriate for activity, work, lifting, as well as just everyday use. 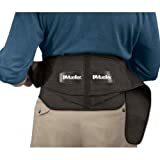 People who have bought it find it extremely adjustable, supremely comfortable, and find the support it offers excellent for dealing with disc problems and a weak core; some notice almost complete relief from pain when wearing it properly. It comes in three different sizes – S/M, L/XL and XXL – so as to fit just about anybody, from waists of 28 inches to 53 inches. Unfortunately, some users have found it hard to properly size. Otherwise, it’s a perfectly viable option for pain relief and back support. 3 different sizes to choose from. The Mueller 255 is another very popular back brace, well known for helping aid with pain relief in addition to providing compression and support. It features a lumbar pad on the back, which makes all the difference in supporting the lower back and relieving pain. There flexible steel supports along the spine, with internal molded plastic components that keep the brace from rolling or bunching, while providing concentrated lumbar support. It has dual, outer elastic tension straps for easy adjusting. On top of all that, it is very comfortable and appropriate for all different activities – driving, sports, walking, sitting in a chair at the computer. It works quite well for relieving pain, and good for help with strains and minor back injuries. It’s still quite inexpensive, as well. However, some reviewers find it very bulky and uncomfortable, and it can be hard to size properly; it is not a one-size-fits all, and when too large or small, it will not be capable of providing the proper support necessary. Thanks to its bulk, it also may not be fit well under clothes. Removable lumbar pad for lower back support. Provides good support during activity/exercises. Pain relief from minor back injuries. Some find it uncomfortable and bulky. The ComfyMed Premium Quality Back Brace is a high-quality back brace, made to be as comfortable and adjustable as possible. In fact, ComfyMed boldly claims it’s the most comfortable back brace on the market. It’s made of a thick, soft foam, that – besides being comfortable – is machine-washable and durable, and supports the back amply without overly restricting movement or weighing you down, which makes it excellent for remaining active while recovering from injuries. The ComfyMed provides good pain relief from things such as scoliosis and sciatica, as well as for injuries such as torn muscles, herniated or degenerated discs. The additional lumbar pad, which can be taken in or put back in as you please, provides excellent support for your lumbar spine. Those who have used it speak of huge reductions in back pain and discomfort, both while sitting or standing for long periods of time, and when driving. It comes in both Regular (26”-37”) and Large (38”-50”) sizes, and is very adjustable thanks to the Adjustable Double Pull Compression straps, which have easy grip cinching handles on both sides. You can also feel the substantial build quality. Smaller reviewers have noted that it does not fit them properly (under 5’ 5”) and tends to roll and bunch up. Also, the metal D-rings on the front of the brace can be irritating when they flop around. It’s best worn over clothing. Very high-quality, durable construction; thick, soft foam is comfortable. Removable lumbar gives excellent back support. Does not fit smaller people; bunches and rolls up. Metal D-rings can be annoying. Velcro doesn’t always hold well. The Comfort Posture Corrector from TOROS Group does more than just support your lower back, doubling as a posture correction, as well. This makes it especially useful not just for back injuries and pulled muscles, but also conditions such as kyphosis and scoliosis, and for back conditions aggravated by bad posture. It is meant to be worn for 3-4 hours a day, but that should be built up to, starting with 15-25 minutes a day, and adding 20 minutes per day. Regular wear helps to build muscle memory and improve your posture in the long run. The back brace features a lumbar pad that, like other braces such as the Vive, provides for relief from injuries and support during physical activity. Both the lumbar pad and the shoulder straps are adjustable to help you find the perfect fit. Care must be taken so as not to overtighten the Comfort Posture Corrector, as that can cause excessive tension and ultimately lead to more harm than good. You should also avoid wearing it all day. Reviewers find it very comfortable, and that it provides good relief from back injuries and spine conditions – and that it really does help improve posture over time. Some complaints include that it runs small and is hard to fit, and also that the metal stays in the back have torn through the fabric. Shoulder straps help improve posture – slumped and rounded shoulders – through muscle memory. Lumbar pad for lower back problems. Designed to provide relief for conditions such as scoliosis, kyphosis. Can only be worn 3-4 hours / day. 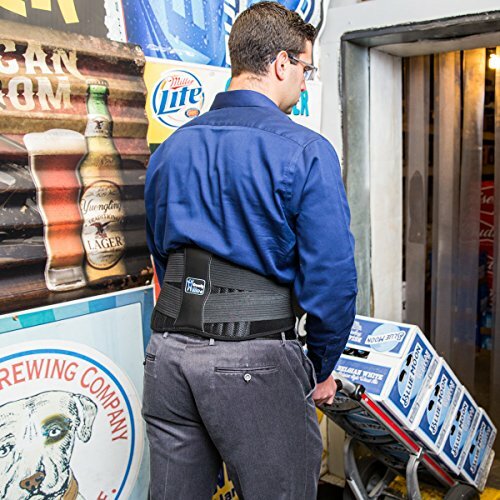 We recommend the BraceUp as our top pick for a back brace, thanks to its adjustability, range of motion and flexibility, and added stays for additional back support. 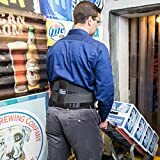 It comes in 3 different sizes to choose from, offers some compression, and has breathable mesh panels for keeping cool and comfortable, making it an all-around strong choice for a back brace. For an upper back brace with posture correction, the Comfort Posture Corrector is another solid option.